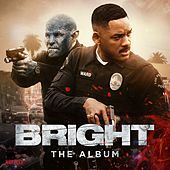 Setting the mood for Will Smith’s orc-and-cop buddy flick, Bright’s downbeat grogginess is signaled by song titles: Broken People,” “World Gone Mad,” “Darkside,” “Danger,” “FTW (F**k The World),” not to mention “Smoke My Dope.” But it also envisions pop via trap rappers, electro-dance divas, EDM knob-turners, twee-falsetto indie acts and country heartthrob Sam Hunt covering Woody Guthrie. Chorus hooks from Bebe Rexha and Kiiara soften up rap guys, who break bread with rock guys; Tom Morello’s guitar adds crunch to A$AP Rocky, Meek Mill rhymes “west side” with “Bed-Stuy,” Rag’n’Bone Man and Neil Young howl bummed-out 21st Century white blues, Camilla Cabello and Migos and Portugal. The Man spread newfound fame around. 20 years earlier, a lot of it could’ve passed for trip-hop. 2017 This Compilation 2017 Atlantic Recording Corporation for the United States and WEA International Inc. for the world outside of the United States.